This level have normal difficulty and you need to follow few simple strategy and steps to reach requirement. 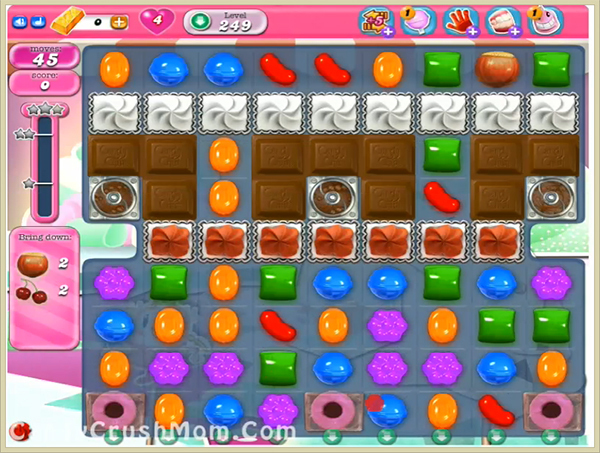 For this level first you should try to play near to blockers so candies can appear on board and ingredients wont stuck on them. After try to play near to ingredients or use special candies or make special combo to take them to fast to reach reach requirement before all moves. We completed this level with 107020 score using above technique that we share and got three star score and luckily reach requirement before single remaining move.